This year's GT350 makes the optional Track Package standard. It's only money, so, YOLO? Yes, #yolo. From base to Shelby, the 2017 Ford Mustang reminds us why America loves its pony cars so damn much. When the latest Ford Mustang sprang to life in 2015, the newest version of the pony-car classic took some big strides into the modern era. Did it gallop? We wouldn't pun that badly, but the 'Stang rolled over on its pony-car roots, dumped its live axle for an independent rear end, and brought turbo 4-cylinder into the mix—and did it all very well. The latest Mustang is the best Mustang ever, and that's before we even talk about the ferocious GT350. For 2017, the Mustang changes little, and returns as a coupe and as a convertible, in base, GT, and Shelby trim. Most of the Mustang's evolution happened under its skin. Its turbocharged inline-4 available is an epic shift in how Ford defines performance, and the Mustang doesn't come out badly for it. The inline-4 delivers strong performance even though it underwhelms in its soundtrack. Of course we'd skip the base V-6 and shift attention right to the GT's intensely strong 435-horsepower V-8; it hustles best when it's amped up with a Performance Pack that includes a Torsen limited-slip rear end, summer tires, Brembo brakes and extra body bracing. Fuel economy is above average, but don't say we didn't warn you about the GT350's gas habit. Much has happened since the previous Mustang with respect to steering and ride comfort, and credit goes primarily to a wider track, a new independent rear suspension, and lots of engineering effort toward eradicating all the roughness. 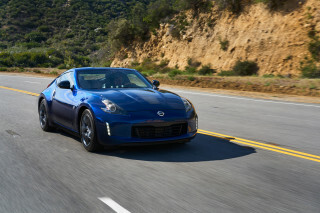 This car simply outclasses the previous 'Stang, with exemplary control, tracking, and stability. True power deviants should inquire about the Shelby GT350 in polite tones. The GT350 introduces a flat-plane-crank 5.2-liter V-8 makes the most of the Mustang's finessed chassis dynamics—and introduce a series of aero and chassis upgrades, including Ford's first application of MagneRide damper technology. It's a stunning track car, not quite as friendly on the road as a Camaro SS, but trackable to your wallet's limits. The Mustang Convertible is as sunny as ever, especially with the Performance Package. Its insulated cloth top has a sleek profile and blots out of a lot of road noise. With the sixth-generation Mustang's debut for the 2015 model year, Ford showed it could give its iconic pony car modern moves while preserving its heritage cues. But the changes weren't radical. All the traditional Mustang cues were mashed into the new pony car, and with a low and wide stance, the Mustang's pretty and graceful canopy rests on muscular haunches. Yet some of the details are a little soggy—the tilted taillight panel, the hashmarks that hashtag the headlamps. In the 2016 Mustang, more heritage cues reappeared—most notably, hood-vent turn signals and various California, Pony, and Black Accent Packages. A painted-black roof option is now also available on turbo and V-8 Mustang GT models. All that means there are more chances to individualize the Mustang, which with its recent redesign became better detailed inside and out. It's not just a little more plush, but more technical and advanced—and in some forms, it's become a luxury coupe of the highest order. Inside, the cabin is solidly laid-out and more youthful than just about any other luxury coupe—and richer-looking than the Camaro's cabin. There is a distinct aviation-inspired theme, while large, clear instrumentation puts vehicle information right in front of the driver in the roomier cabin, and improved ergonomics and tactile switches and knobs provide better control. The Mustang is still a 2+2 at heart; but it's nearly the size of a Ford Fusion and far, far more usable inside than a Camaro. Front-seat room is generous and not just for the segment and the great Recaro seats are bound to be a popular upgrade over the standard sport seats. The back seats are token gestures, but that's pretty much what we expect here; and as for the trunk, it's good enough for weekend bags, but we wouldn't call it generous. In all, it's enough car for a long weekend for two, for sure. 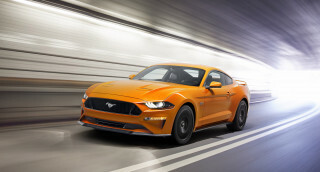 The Ford Mustang has earned limited "Good" ratings from the IIHS, and the Coupe earns five-star scores across the board from the federal government. Its list of high-tech features includes driver-adjustable stability, steering systems, throttle and transmission systems; standard Bluetooth and a rearview camera; and options for blind-spot monitors, adaptive cruise control, and a forward-collision warning system. Base V-6 models don't offer much in the way of fun options; you'll have to pay into the turbo-4 to get bigger wheels and tires and a Performance Pack—and the latter, with its stiffer chassis tuning, stronger cooling, Torsen differential, six-piston Brembo front brake calipers, and appearance upgrades is what you want if you don't think of your Mustang as a cruiser. Pricing may creep up on you with V-8 models, where when you add the Performance Pack and options like Shaker Pro audio, a mid-$20,000 pony car can turn into a $40,000 sports car. That may sound on the high side for a Mustang, but we're truly asking whether we'd rather be behind the wheel of a Mustang GT or a $65,000 BMW M4, which is very telling. Ford's new Sync 3 infotainment reboots our general opinion of infotainment systems in sports cars—it's good enough to pay for—but the ultimate gift to Mustang fans? Launch control and line lock. The former lets anyone knock off impeccable 0-60 mph times, while the latter enables NHRA-grade smoky burnouts. The Mustang casts a charming vintage shadow; the cockpit could tidy itself up a bit. The Ford Mustang drew up a fine mix of heritage and modern styling cues when it was new in 2015. It took few changes, and didn't make any abrupt change or about-face. Inside, in general, the Mustang's aviation-themed cabin is organized neatly and fitted better than any Mustang yet. A metallic chin-up bar sweeps across the dash like a pull-up bar. It's effective at telegraphing strength, but it devolves the classic dual-binnacle look to a couple of eyebrows over the dash. Large, clear gauges are tucked in more deeply, and the tactile toggle switches and knobs provide better control. There's a lot going on in this cockpit, and the stronger twin-binnacle look of the last-generation Mustang helped organize it all better. Another pass by the styling crew could tame this on a reasonable budget, we think. From the outside, the Mustang dances through its own greatest hits. The profile is now more clearly a descendant of the fastbacks of recent vintage. We won't call it as fluent as the 1960s originals, but it's a purposefully styled car with a broad, imposing face and proudly swollen fenders. The roofline arcs as a graceful canopy stretched over the passenger space. While the Mustang makes a lot of good in the general sense of its design, we can see plenty to be critical about in the up-close details. The era-mashing fillips of the last-gen 'Stang worked together a little better. There's some disparity between the heft of the lower body and the thinness of the pillars that brings old Pontiac Grand Prix two-doors to mind. The black panel that surrounds the taillights lays flatter than Mustangs have—it tends a little more Mopar-ish as a result. The tripled-up light pipes that slash at the grille have a distinct "Miami Vice"-era vibe. Two new appearance packages may help lend a better light on this look. A Black Accent Package looks like it embraces that side, with 19-inch black painted alloys, a black decklid spoiler, dark taillights trim, and special "5.0" badging and pony logos; meanwhile, a Pony Package brings more brightwork and may bring back more of a nod to earlier Mustangs. Separately, a new California Special Package is offered on Mustang GT Premium models, really jazzing up the look with ebony-painted machined alloy wheels, ebony leather and Miko suede, red contrast stitching, a special aluminum dash finish, hood striping, a strut tower brace, black-painted mirrors, and other dress-up items. Savor the V-8 burble while you still can; the GT and GT350 are our favorite Mustangs of all time. The Mustang's 2015 revamp marked the return of a turbocharged 4-cylinder engine to the Ford Mustang lineup. In 2016, the fearsome Shelby GT350 seized the reins and took us for a performance loop unrivaled in 'Stang history. This year, it's largely carried over, for which we're grateful. Ford's long-suffering 300-horsepower, 3.7-liter V-6 does base-car duty here. We're assuming that it's entirely adequate and underwhelming, but it's not a car Ford makes a big fuss about in press fleets. We'll leave that to you to decide why. The turbo-4 gives us permission to ignore it, anyway. It's no GT substitute, but it's powerful enough to entertain. A direct-injected, twin-scroll-turbo unit, the 2.3-liter inline-4 is rated at 310 hp and 320 pound-feet of torque. The 4-cylinder takes some getting used to. 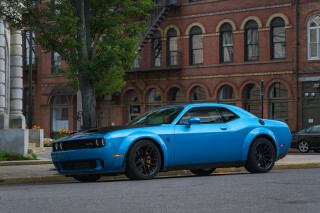 It cracks off 0-60 mph times of less than 6 seconds, but its power delivery and most of all, its acoustic soundtrack, don't conjure up all the right muscle car feels. We say that with love, as SVO fans. The turbo-4 kicks off with a wave of low-end torque right where it should be, and pulls fine through 3/4 of the rev range. The entire time, it pulses with an artificial, buzzy sound that's disconnected from the classic Mustang V-8 burble. Ford amplifies and adds some engine noise via the car's speakers, and we'd suggest another round in the studio. Coupled to either a 6-speed manual or the optional 6-speed, paddle-shifted automatic that we used to drill through L.A. traffic and across the spines of some Malibu canyons, the turbocharged engine felt most powerful once we clicked it through its pre-programmed driving modes. The slower throttle and shift response cleared right up once the shifter was pulled down into "Sport." The turbo-4 percolates nicely in its wide powerband, and drops its laggy act. The Mustang we want to feel and hear is the GT. Ford's 5.0-liter V-8 is its lead singer, and frankly, it could stand out a little more in terms of vocal presence. 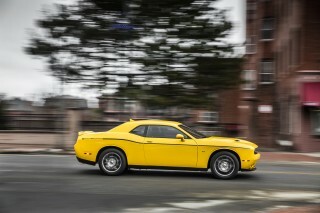 The V-8 checks in at 435 hp and 400 lb-ft of torque. 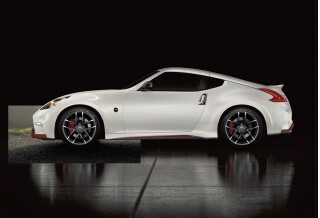 Zero-to-60 mph times are pegged at about 4.5 seconds, and top speed is set to 155 mph. As gutsy as it is, the V-8 sounds isolated behind a thick wall of sound deadening, which it is. Maybe we've just been spoiled by Jaguar's crackly 5.0-liter V-8. As for the stunning GT350, it's an outlier, what with its flat-plane 5.2-liter V-8 and its magnetically damped ride. It's a thrilling track specialist that can feel a little brittle on everyday roads, but we can say truthfully it's the best Mustang in history. For a deeper dive into that model, take a look at Motor Authority's first drive of the Ford Shelby GT350. The V-8 gives full license to exercise the Mustang's wonderfully composed road manners car and to anticipate its huge track potential. With a strut front suspension and independent rear (yes, Ford finally ditched the old setup that's hounded the Mustang), a serious limited-slip differential, and standard 18-inch wheels and tires, the Mustang is far more nimble and forgiving. The attitude is flat, with none of the old axle hop. Like the turbo-4 car, the Ford Mustang GT works its new suspension and revamped electric steering for great effect. Smoothly damped and twice as capable at snuffing out dive and squat, both Mustangs have great ride isolation and steering precision, whether the rack's feel has been toggled to Comfort or Sport from Normal feel. Hurtle it down a straight, scrub off speed with the GT's four-piston front brakes and thick treads, and the Mustang tucks in neatly and quickly into the next corner. Flick more of the toggles, and the Mustang cycles through drive modes that set its throttle, steering, stability control, and automatic-trans shifts. Skip by wet/snow and normal for Sport's deft reflexes—or Track, for an intervention-free slide (not recommended in Malibu, where washouts and police are equally dangerous hazards). For those into old-fashioned muscle-car drag racing, there are two terms to remember: launch control and line lock. Knock off impeccable 0-60 mph runs with the former, smoke away as much tire as you can afford with the latter. Line lock only works on level ground with steering set straight ahead and takes a half-dozen button clicks to access, so practice makes perfect before you make your coffee-and-octane debut. If cornering is more your game, get the Performance Pack option on the GT. It swaps out the limited-slip differential for a Torsen unit, skins the wheels with Pirelli P Zero tires (255/40R fronts, 275/40R rears), slaps on Brembo brakes, braces the strut towers, and stiffens up the sway bars, springs, and dampers. It sticks to the ground in a way that used to be reserved for the likes of the M3—and yes, it might even be a more willing dancer than the current M4. It's better than the one in the Camaro, but no one's going to volunteer to ride in the Mustang's back seat. When the Mustang was redesigned in the 2015 model year, it stepped into a new league for ride and handling. Comfort and quality weren't left off the list. The Mustang is now roughly the size of a mid-size sedan, at 188.3 inches long and with a 107.1-inch wheelbase. 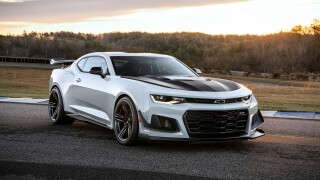 Predictably, that gives it better interior space than its biggest rival, the Camaro. The Camaro's chintzy interior space gets dragged by the Mustang's taller, hippier shape. The Ford's front-seat room is more than generous. Its great Recaro seats are bound to be a popular upgrade over the standard sport seats. Ford has done a good job with interior storage in the Mustang, as Ford has with most of its current cars; cupholders and a mobile-phone bin are sited perfectly—as is the USB port that stares out from behind the phone bin. The Mustang's built to a higher standard than before, but the combination of surfaces and textures wasn't perfect on the cars we drove—it was not as good as a Flex crossover, which is at a similar price point. There's still enough hard plastic here to pad in future updates. The Mustang rides in a surprisingly quiet, refined way; but if there were one thing we'd wish to upgrade, it would be engine noise. Four-cylinder versions buzz with an artificial noise pumped into the cabin; it's neither pleasant nor evocative of performance, and in the absence of anything better, we wish we could turn it off. The opposite's true of the V-8: what's there sounds lovely, but the big engine sounds like it's being suppressed for some political reason—probably to give the exclusive GT 350 and its pulsating flat-plane-crank V-8 its due. For anyone over 5 feet tall, there's no chance at sitting upright in the back seats. The roofline races to the 'Stang's shoulders quickly. The rear seats fold down to pass through to the trunk, but the trunk itself will hold a couple of golf bags—somehow, that's become the universal gauge for acceptable storage space. The maximum of about 13 cubic feet of storage space in base cars goes down to about 11 cubic feet with the top audio system. The Mustang posts impressive crash-test scores, and abounds in safety tech. The Ford Mustang isn't a car we expect to perform well in crash tests, but it does, and Ford outfits it with lots of useful safety features and options. The NHTSA has given the Mustang five-star scores across the board. The IIHS rates it "Good" in most tests, but in the small-overlap crash test (which simulates hitting a pole on a front corner), it scored only "Acceptable," which keeps it from the Top Safety Pick ranks. Outward vision is much better than we expected in the Mustang. Sure, there are blind spots over shoulders, but turn halfway around and the big rear glass opens up the view more than expected. The Mustang also has far more head room than its rivals, so there's less uncomfortable neck-craning in general. The Mustang offers a standard rearview camera and standard Bluetooth connectivity. Reverse parking sensors are an option on most models. But beware: To get the leading safety features like adaptive cruise control and blind-spot monitors, you have to be at least in mid-range territory before you can even tick that option box. They're not quite snowflakes, but there's no reason for any two Mustangs to be exactly alike. Mustangs from the past felt humble, spare, stripped-down. No more. Today's Mustangs can run up their stickers with load of luxury and technology features, though many of them are locked out for V-6 buyers. 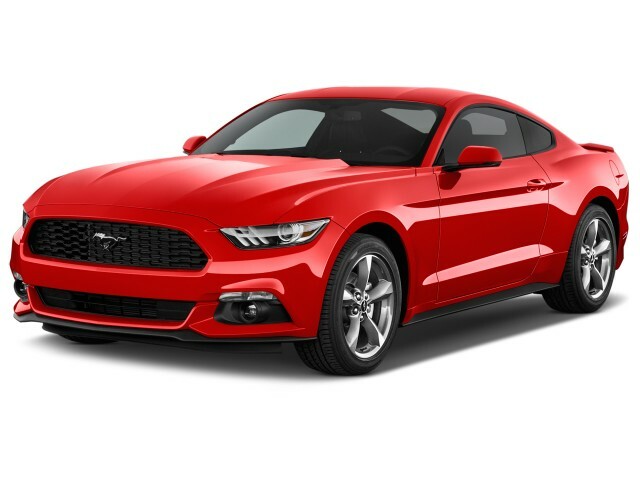 Every Mustang comes with power windows, locks, and mirrors; air conditioning; cruise control; a 50/50-split folding rear seat; an AM/FM/CD player with two USB ports and an aux input; Bluetooth with audio streaming and voice control; a rearview camera; and keyless ignition. A power driver seat, rear parking sensors and 18-inch wheels are options. The V-6 model is now essentially sold as a rental-car special—or a model for those who simply don't care to get any of the special features. Leather seating, HD and satellite radio, a power passenger seat, the Performance Pack, 19-inch wheels, and Recaro seats are simply not offered on the V-6. The same goes for any of the advanced safety technology features like adaptive cruise control, forward-collision warning, or blind-spot monitors. Turbocharged 4-cylinder Mustangs add active noise cancellation and a power passenger seat. Options include the Performance Package; 18- or 19-inch wheels; and cloth Recaro seats. Turbo-4 Premium models add satellite radio; more speakers; Sync 3 infotainment; and pony projection lamps from the side rearview mirrors. A Shaker audio system is available in this version. That Performance Package is something we consider essential. It swaps out the limited-slip differential for a Torsen unit, skins the wheels with Pirelli P Zero tires (255/40R fronts, 275/40R rears), slaps on Brembo brakes, braces the strut towers, and stiffens up the sway bars, springs, and dampers. The basic GT shares the basic 4-cylinder's equipment, while the Premium adds leather-trimmed seats; a universal garage door opener; ambient lighting; launch control; and line lock. The Performance Package is an option, as are 20-inch wheels; adaptive cruise control, blind-spot monitors, and forward-collision warnings; voice-activated navigation; and leather Recaro seats. GT350s get all the performance upgrades, and this year add standard Track Package features, including magnetic dampers, transmission and differential coolers, and a big spoiler. Base Mustang coupes run more than $25,000. GT350s tach it up near $65,000. A loaded GT, at more than $45,000, is something of a sweet spot—if you were cross-shopping a BMW 4-Series. Maybe. If you're like us, a trip through the Mustang online configurator will require a loan application and an asthma inhaler. With 4- and 6-cylinders, the Mustang turns in acceptable fuel economy; you're on your own with the V-8s. From the 4-cylinder EcoBoost, which tops 30 mpg on the highway, to the V-8 GT model, which now gets nearly 20 mpg combined, the Ford Mustang does better on gas than it does a few years ago. We wouldn't call it frugal, though. And choosing a convertible exacts its own penalties of up to 3 mpg. The base V-6 Mustang is a disappointment, by most measures. It's rated at 18 mpg city, 27 highway, 21 combined with either the automatic or manual. It's probably not so surprising that the turbocharged 4-cylinder Mustang gets the best numbers. It also includes active grille shutters, which might help aid mileage in colder weather and on the highway. Mileage ratings for this 'Stang are 21/30/24 mpg for the manual and for the automatic. Four-cylinder convertibles are rated at 21/27/23 mpg for manuals, 20/28/23 for automatics. And, then there's the V-8. Given the sheer happiness its performance imparts, it's worth the middling 15/25/18 mpg rating with the manual. Automatics are rated at 15/24/18 mpg. Convertible V-8s are 14/23/17 mpg with a manual, 15/23/18 mpg with the automatic. Fuel economy ratings for the Ford Mustang GT350 check in at 14/21/16 mpg. You're on your own with this one. We might have a number for OPEC somewhere. We'll text it to you.